A video, showing a police officer shooting a family's dog has sparked controversy online and accusations of a cover up by the department. 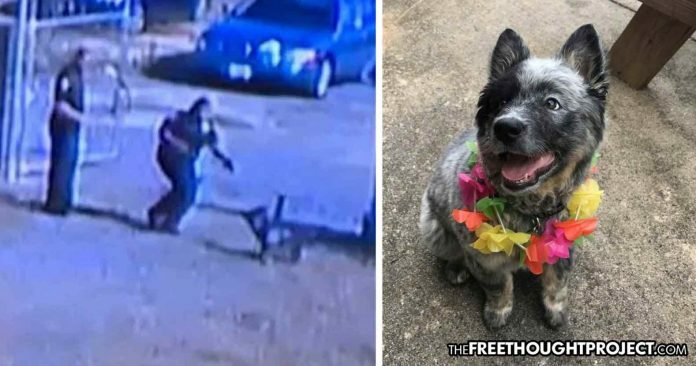 Reidsville, NC — Another video of yet another police officer shooting another family’s dog has been posted to social media and it has sparked a firestorm of outrage. After the Reidsville Police Department ruled the shooting justified, that outrage grew to threats. The incident happened on August 7 when Police Chief Robert Hassell and Reidsville officers visited the Police Impound Lot to take inventory and also observed the work of Quality Fencing of Reidsville, a company owned by Greensboro firefighter Kevin Paschal. Paschal had his dog dog Auger out at the site with them. When officers approached a truck on the lot, they say they heard a dog barking behind it and they backed up. That’s when Auger ran out. As the video shows, Auger darted out from behind the car and briefly appeared to put his face by the officer’s boot. Within seconds of Auger doing this, Officer Glen Wade pulled out his pistol and fired 5 rounds at the collie mix. Two of those rounds struck Auger who died from the wounds on the scene. After watching the video, the family believes that the officer was not justified in shooting their dog and they have since called for justice for Auger. They also say that witnesses saw the officer shoot at Auger before he ran out from behind the truck. However, the department has ruled the shooting justified as the officer claimed he was in fear of his life and had no other choice to shoot the dog. “They both began to back away from the truck and within seconds, the canine sprinted full speed in an aggressive manner towards Officer Wade,” the report reads. “Since the incident occurred in less than seven (7) seconds from Officer Wade knowing the dog was present until the threat was neutralized, other options such as OC pepper spray or Taser were not reasonable options,” the report reads. A third-party investigation by US Investigative Security Services concluded that Wade’s use of deadly force was “justified” and “in compliance with applicable departmental policy” as a form of self-defense. While the department ruled it justified, the Paschal family says they are lying about what really happened and said that witnesses and the video back up their story. Below is the statement from the Paschal family’s attorney, Darren A. McDonough, which details the “troubling” problem with the official version of events. Below is the video. Knowing the family’s side of the story and the department’s side of the story, do you think that Auger had to lose his life? Video just in shows the moments before a Reidsville police officer shot a family dog.Do you think the shooting was justified?